BROOKE: The show can’t be canceled! I’m Brooke Shields, dammit! LINDSAY: I heard it is. KIM: Guys. Stop. What are you fighting about anyway? LINDSAY: For some reason, Brooke is convinced that the show isn’t canceled. And I told her denial is a helluva drug. BROOKE: She’s just saying my show’s canceled because she doesn’t want to kiss Mushy Lips anymore! But I’m Brooke Shields and when I say my show is number one, it’s number one, dammit! LINDSAY: Well, yeah, that’s a factor. LINDSAY and BROOKE: (in unison) Andrew McCarthy. KIM: That’s so mean. He’s not that bad. LINDSAY: Shut up! That’s easy for you to say! LINDSAY: You get to rub yourself on what’s-his-pants all day, every day! It’s not fair. BROOKE: She does have a point. I mean, why do you get to rub up against what’s-his-pants and not me? I’m Brooke Shields, dammit! KIM: Wait. Why do you keep saying that? You sound crazy. Like, uh, Brooke Shields-crazy. BROOKE: Well, I’m the star, obviously. And I went to Princeton. BROOKE: Oh, shut up and get another terrible nose job. LINDSAY: You just crossed the line. LINDSAY: You’re Brooke Shields, dammit. Yeah. I got that. 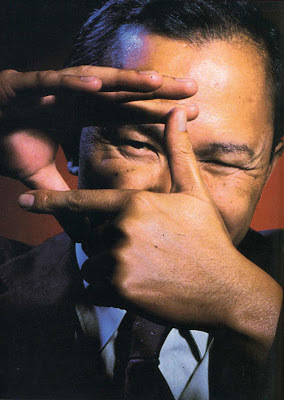 Happy 60th birthday to director John Woo! We are so filled with awe and respect for your glorious, incredible list of film credits, but right know what we really want to hear is every story you’ve got about crazy Tom Cruise during the filming of MI:2. Was he nice? Was he creepy? Did he test you? Did he jump up and down on a couch? How does he remain so ageless? Will he ever rock a different haircut? Tell us everything! Oh, we mean. Happy Birthday. We hope you eat lots of cake. The burglar found the empty PlayStation 3 box and ran out of the room, but Damian was waiting for him. “Once I saw him take off running back, I jumped off my (bunk) bed and I grabbed my sword … and I just waited for him,” he said. Damian said he lunged at him with his samurai sword, striking him in the chest. I’m pretty convinced that Dakota Fanning is an alien. That’s not a bad thing, really. But she’s most certainly an alien–that perky little voice, the insanely precocious mannerisms, the weird, spacey, toothy grin. She’s weird. But incredible. Sure, I love her. I love all weird little aliens. Watching the 13-year old scoop up the Best Female Movie Star Award at Nickelodeon’s Kids’ Choice Awards earlier this week, I found my mind wandering wearily off into DakotaFanningquestionland… How long must we wait for Lil’ Miss Fanning to jack up her self-infatuation, pick up a nasty coke habit, start flashing her bosom, and develop an unhappy obsession with changing her hair color a la Lohan? What day will it be that she storms off the set suffering from a teenage nervous breakdown screaming, “Paramount doesn’t own me, my AGENT owns me, you fucker!” What is it like to be a little alien? What do little aliens think about? And then I wonder… might there ever have been any reason for little Dakota to think of Asian people as silly, babbling, bumbly messes? …to which I actually have an answer (Yes). Sure, this interview took place years ago when Dakota was still promoting War of the Worlds with Crazyology Messiah Tom Cruise. But just look at her! The consummate professional, having no choice but to laugh uncomfortably at the 17-year old DISGRASIAN, a muttering, hokey, blathering, blundering idiot who makes Asian dudes in high school seem about as desirable asa brown, mushy banana on a sweaty, smelly day. Little Alien, forget about him! All men are not created equal.